Outdoor bar stool with an elegant Dark Grey Batyline weave and bamboo effect frame. Designed for outdoor commercial applications. Available from stock for a fast delivery. 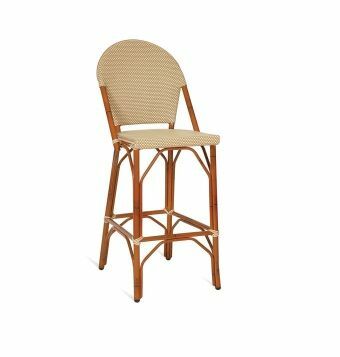 Sophisticated design high stool with a sturdy square seat and arch back in popular Batyline weave. Perfect for use in a sociable outdoor area. Please contact our sales team for further information on bulk orders.